.. 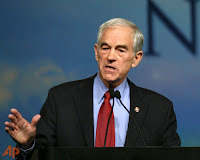 The Republican convention could conceivably feature a major address by Paul calling for the abolition of the Fed, FEMA and the CIA; American withdrawal from everywhere; acquiescence to the Iranian bomb — and perhaps even Paul’s opposition to a border fence lest it be used to keep Americans in. Not exactly the steady, measured, reassuring message a Republican convention might wish to convey. 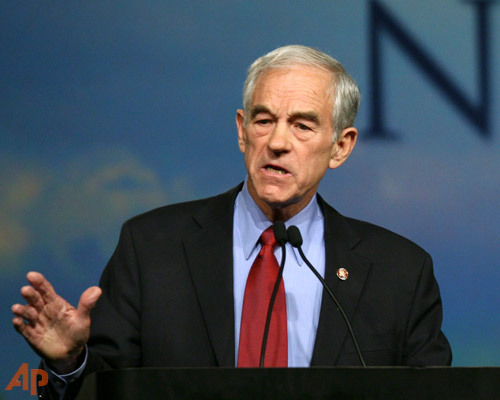 For libertarianism, however, it would be a historic moment: mainstream recognition at last. Tea Party members have been influenced by Congressman Paul. His ideas are not as out of step with our history and Conservative ideas as has been illustrated by the media and established GOP. By the way, contrast his son Senator Paul's comments with our Senator Lugar. We need someone like Senator Paul to represent Hoosiers!! In New Hampshire, not only did Ron Paul come in second in the Republican primary, he was also the runner-up in its Democratic primary, through write-ins. Steve Watson analyses this on line.